Most everyone alive on Planet Earth has some memory of their first interaction with the great Bugs Bunny. Mine happened to be through the secret doodles of one of his original fathers, Chuck Jones. Every Monday afternoon from the time I was six years old, my mom would drive me to a strange house filled with all sorts of curiosities for my weekly piano lesson. My octogenarian teacher Margaret Neumann and her husband Max were collectors of peculiar and interesting artworks and objects, which they used to decorate every nook and cranny of their house. Photos: Max blowing out his birthday candles in front of an artist’s interpretation of The Ride of the Valkyries sheet music, heavily reminiscent of the Chuck Jones film “High Note” (click here for a clip), and Margaret giving my sister and me a lesson on her organ. Upon exploring their house one day, some pen and ink doodles tacked up on the wall caught my attention. Mr. Neumann noticed my interest and asked how much I knew about Bugs Bunny. Before long, I was being treated to a near mythological account of how integral Chuck Jones had been in the creation of some of my favorite cartoon characters. Max and Margaret were part of a square dancing group that included Mr. Jones. The prized piece of Max’s collection was a huge sheet of white drawing paper covered in dozens of cartoons entitled “Chuck Jones – one year of doodles,” dedicated personally to Max. For me, this began a lifelong admiration of the work of Mr. Jones, his co-conspirators in the cartoon world, and animation at large, eventually leading me to study animation at the very school Chuck himself attended. 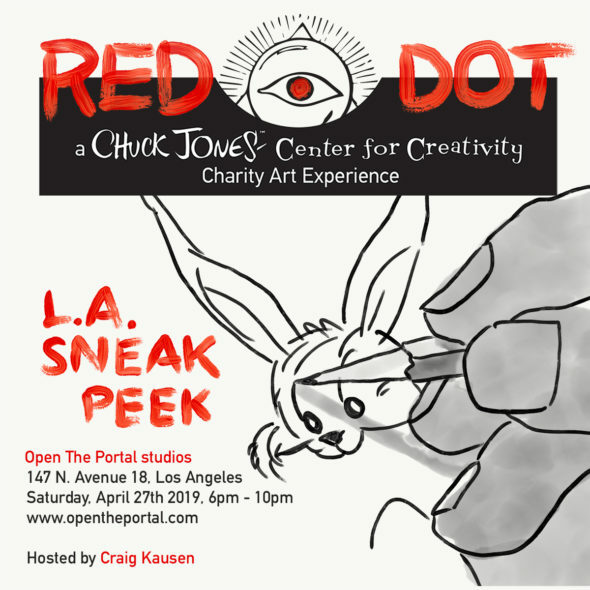 Fast-forward twenty-five years, and I find myself here at Open The Portal, more than a little inspired by the Termite Terrace studio described in books by Chuck and his fellow animators of that Golden Age of animation. After driving by the Chuck Jones Center for Creativity in Costa Mesa several times, I finally decided to stop inside and have a chat to see what it was all about. I walked in wearing an enamel Daffy Duck pin, and the wonderful Carol Erickson at the front desk was kind enough to invite me to an upcoming art opening. Within a matter of weeks, I had met Mr. Craig Kausen, grandson of Chuck Jones and head of operations for the Chuck Jones Companies, which functions as an active charity and manages Chuck’s original artwork, among other things. We bonded quickly over a mutual love for his grandfather’s work and the animation world in general, and have been collaborating on projects ever since.